I really, really liked this one. It was such a great tease for the series. As a prequel novella it definitely did its job. I'm definitely going to check out the rest of the series. It pretty much had everything a good werewolf story should have. Lots of heat, a protective alpha who would die for their mate, a really bad - bad guy, a strong female character who is thrown into a nightmare/fairy tale situation and a strong pack/family to back them all up. Yep, it's all there and I can't wait to see what happens next. 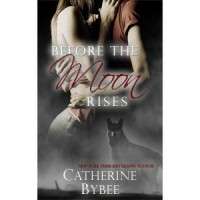 I should also mention that Catherine Bybee's werewolves are just a little bit different than the average werewolf - and I liked that. Straying from the norm but still keeping things familiar is always a good thing. That may not make much sense, but trust me, when you read Before the Moon Rises you will totally understand. I picked up Before the Moon Rises as a Free download from Amazon on December 26, 2012 and read it as part of my 'Why Buy the Cow' 2013 Reading Challenge.